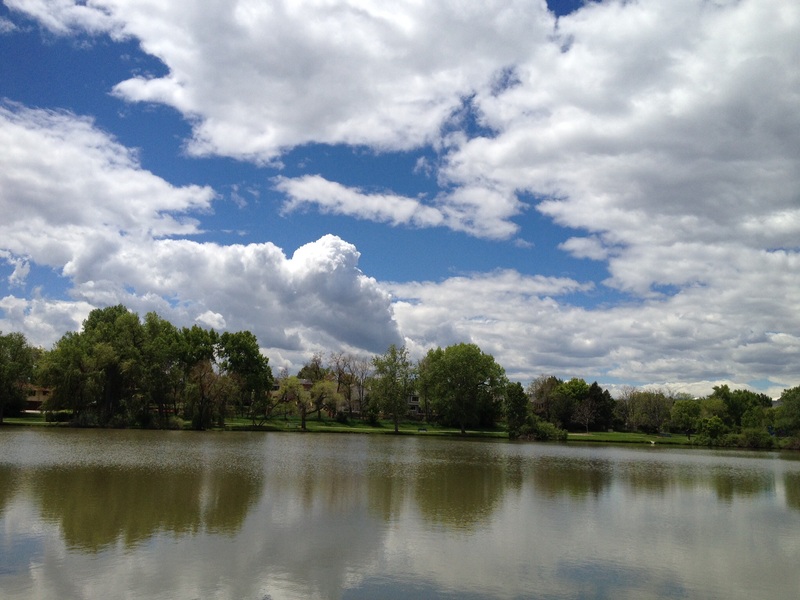 Colorado skies have been indescribably lively, lovely and destructive this spring. These pristine, almost virginal white thunderheads grace our foothills home with nature’s artistry, while promising to wreak havoc for our northern and easterly neighbors. I feel guilty enjoying this stupendous sky art because I know these thunderheads become black with the fury of ferocious storms, hail and tornadoes as they race their way through Nebraska, Kansas and Missouri. We marvel at the heights to which these clouds climb; at the human shapes, animal images and fantasy dragons they form and erase. Our air has been so heavy with humidity, that I feel ocean breezes with nary a beach or wave in the state. 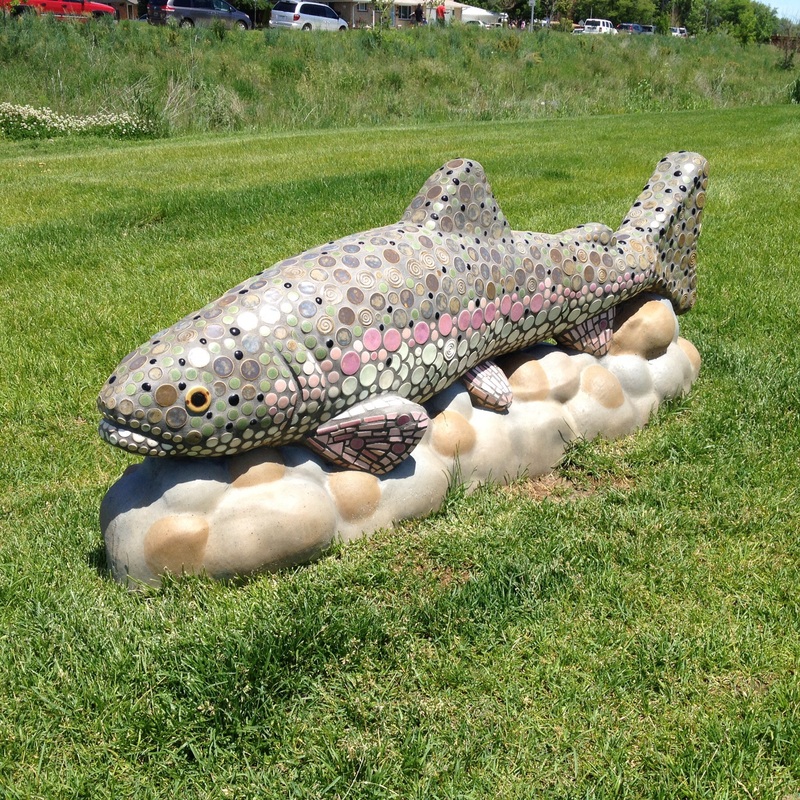 Our rain measurements are record-breaking (central Denver flooded yesterday with 2.5″ of rain and hail in less than one hour) and the exuberance of green, growing plants and shrubs can be seen throughout yards and fields. 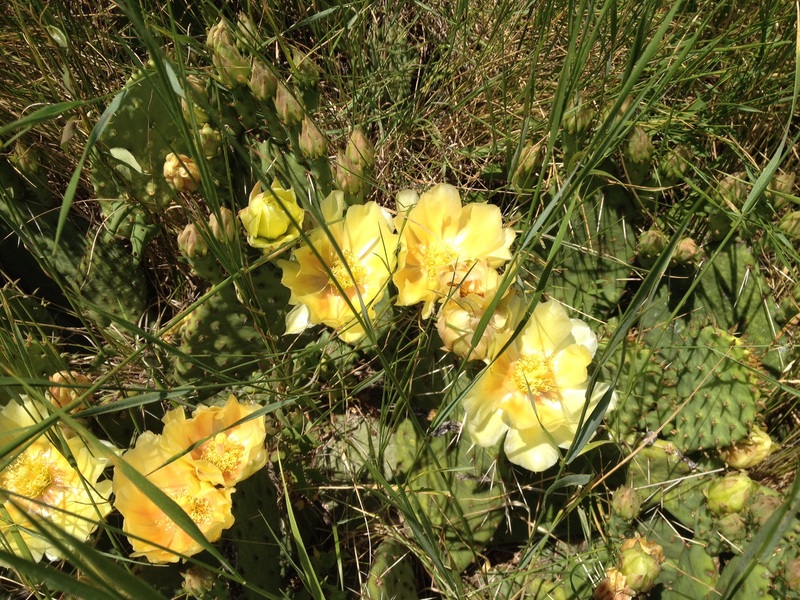 Desert plants that have remained dormant for years in dry springs are blooming along trails. I’ve seen Queen Ann’s Lace towering well over six feet, and cattails in marshes are twice as tall as they’ve ever been. As is our curse in Colorado, our infrequent rainy springs are followed by hot, drying winds, quickly turning the lush undergrowth to pernicious fuel for potential wild fires in forests or on the plains. We are grateful for our local and national teams of wildfire fighters who go anywhere, anytime to fight the raging infernos. If you’ve never seen an air tanker fly overhead, barely able to stay aloft with its gravity-defying load of red slurry and its distinct engine drone … well, it’s second only to a military flyover in your adrenaline kick. Watching those lumbering tankers maneuver through the fire-fueled turbulent wind drafts to drop their load with precision, knowing they risk their lives for each drop … the word ‘grateful’ doesn’t seem to cover it. 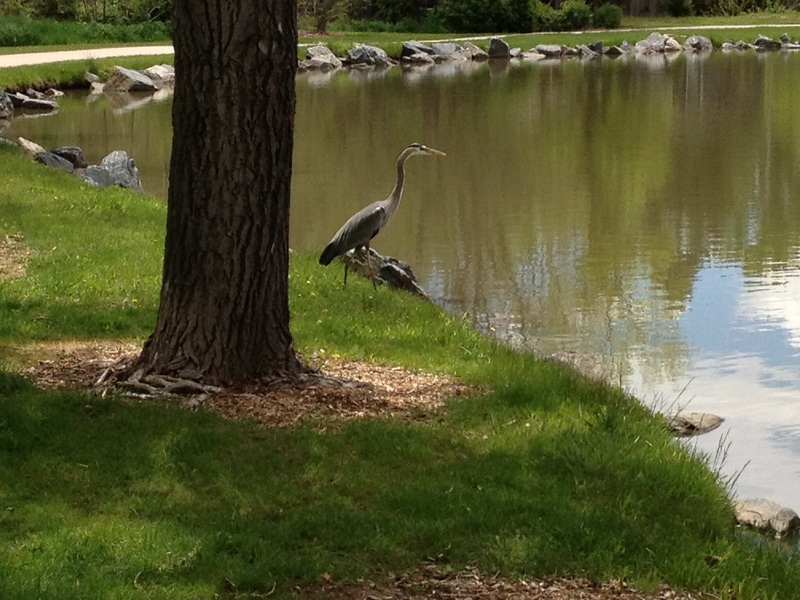 This graceful heron returns ever summer to reside at a small pond about 6 blocks from our house. When I walk the trail around the pond, he sometimes flies away, but on lucky days he simply flies ahead of me a few feet to land again, and we repeat that dance circling the pond – me practically tiptoeing; he (she?) beckoning safely out of reach. For Jude’s Bench Series (we grow our bees big in Colorado)! Even the Fish Flourish in the Rains! My town of Arvada is at an elevation of 5,400 feet (over a mile high). 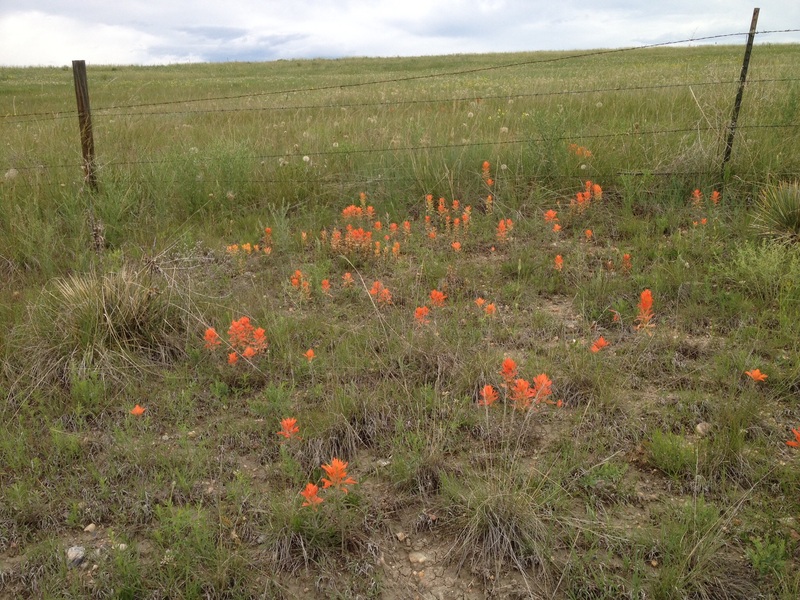 Indian Paintbrush (Castilleja Coccinea), named for its clusters of spiky blooms that resemble a paintbrush dipped in bright red, orange or yellow, grows in many altitudes with varied colors associated with specific altitudes. In our Plains/Foothills 4,000-6,000 feet, we get the orange (C. Integra) plant; the Foothills/High Desert/Montana 5,000-10,000 feet gets the bright red (C. Chromosa) and the Subalpine/Alpine 8,000 feet to above timberline gets a lovely yellow (C. Occidentalis). Hiking high enough to spot that yellow beauty literally and figuratively takes your breath away! Hey! That grasshopper is eating ‘my’ clover! Oh how I want to bite into those tiny pink/lavender nips of clover flower, letting that faint taste of honey treat my tongue. Alas pesticide spraying halted this summertime enjoyment decades ago. Kids today miss a lot! Let’s head outdoors for weekend fun. Wherever you are; whatever you are doing, stay present. Those first few photos are absolutely stunning, the clouds really are that perfect, candy floss -like shape that we see in paintings or children’s books, aren’t they? There’s really nothing about them at this stage that’s threatening, I can’t believe they turn into those nasty storms and tornadoes! 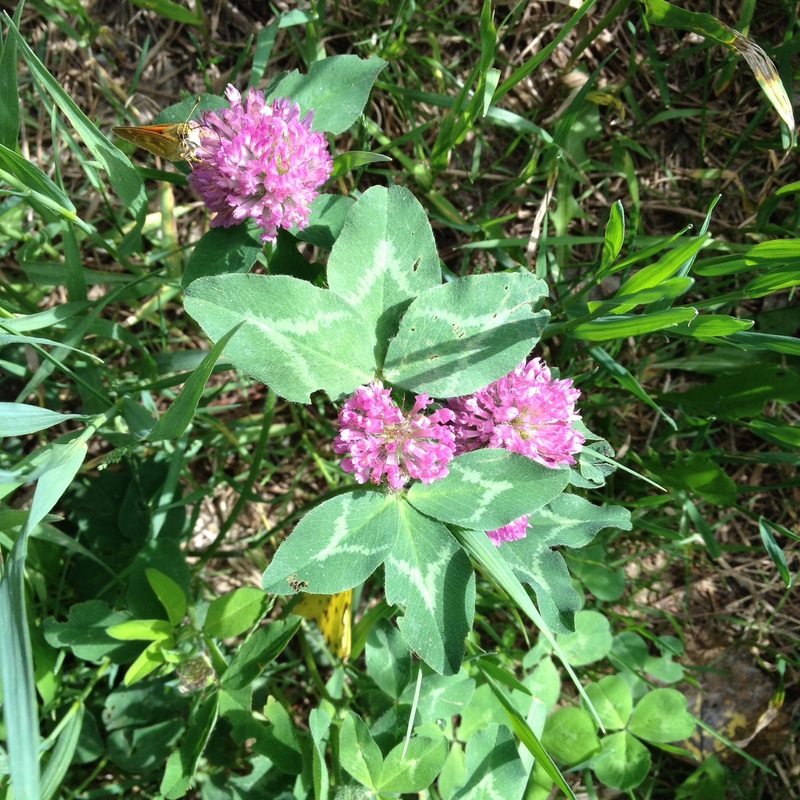 It’s such a shame that we can’t bite into clover flowers nibs, isn’t it — I did that as a kid too. I completely understand the need for pesticides (within reason) but it does comes at quite a cost, and I really think we’ve gone completely over the top with them. Even the stuff that’s organic these days isn’t really. My mum grows all her own fruit and veg — and let me tell you it tastes and looks nothing like what’s in the ‘organic’ section of the supermarket! Thank you, Celine. I miss standing in Dad’s garden eating a sun-warmed tomato with juice running down my arm. I think the Michigan soil had something to do with it because you are right, even some of the organics here in Colorado have little ‘real’ flavor. Growing in clay, even when amended soil, isn’t the same. I know exactly what you mean about sticking close to shelter during those sudden storm bursts. We had one last night where lightning struck something nearby and the crackle made us both jump out of our chairs. Heavy downpour and winds for five minutes then the sun shone again as if it never happened! Our biggest danger is the lightning strikes – killing a person or starting a wildfire. It will strike sporadically with no real warning. I’ve taught Sparks and Raqi to pay attention to the clouds. As long as thunderheads are white, they are safe outdoors, but if the clouds begin to turn gray/black and are moving towards them, they should go inside right away. At the sound of sounding ignorant, is Colorado really flat then? I can see how the wildfires would be a real danger with the heat and dry grass and wood. Does it happen often then that lightening hits people? That must make storms terrifying. We do ok with lightening out here because there are so many sky scrapers and hills/mountains, but in other parts of Asia it’s a real danger, same as you. In Cambodia a local was telling us that people often die from lightening strikes, because you have flat rice fields all around with no trees, nothing tall. So the people who work the fields really stand out and if there’s a lightening strike, they’ll get hit. It’s really quite scary! The eastern half of Colorado is treeless and basically flat (altho you are climbing as you go west; it just seems flat). 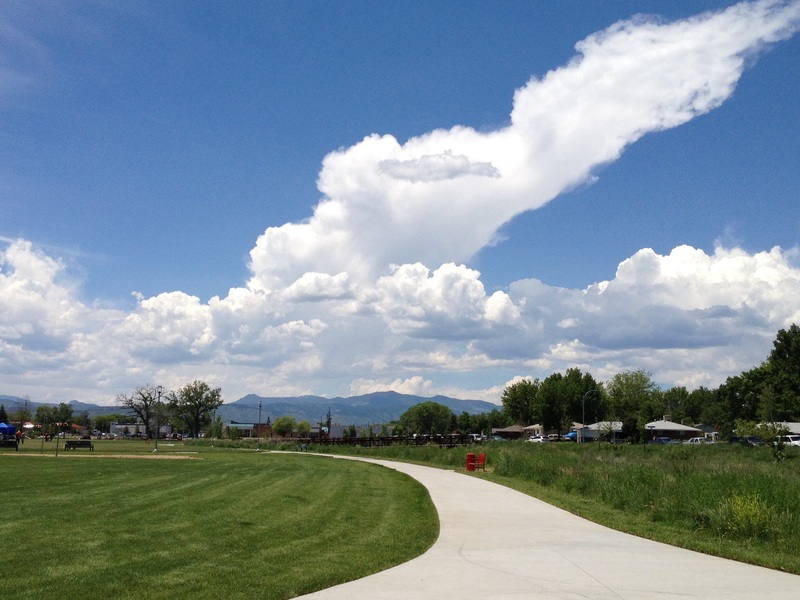 The daily thunderheads form and gather moisture as they come from the west over the Continental Divide (highest peaks). It is VERY dangerous to be hiking above treeline or anywhere on the mountain or foothills trails after 2pm if thunderheads are present because the lightning can (and does) strike without any warning. As long as the thunderheads are white, we are ok at lower elevations, but when they begin to go gray and heavy with moisture, we head indoors till they pass because of the lightning. 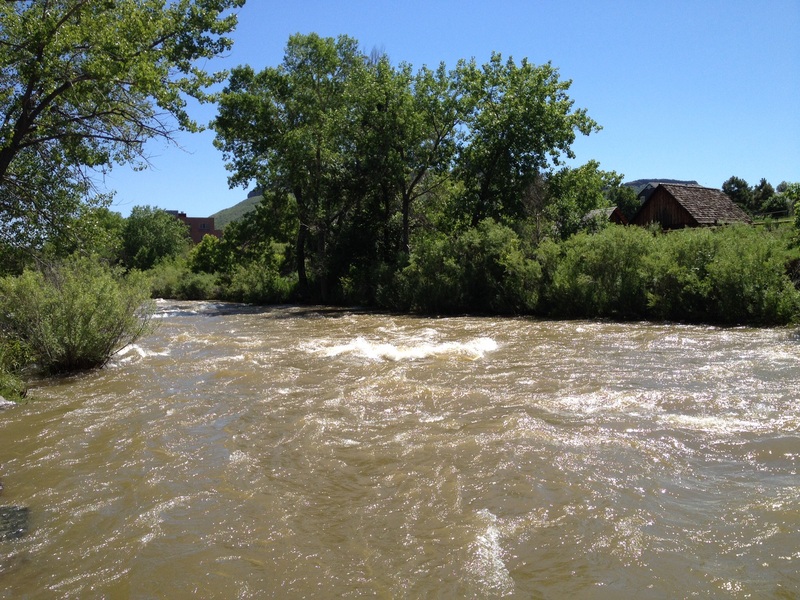 Our Colorado summer storms are short-lived (3 minutes to an hour) but dangerous. After they pass, sun comes out like nothing happened!! Probably more than you wanted to know😀 when I first moved out here almost 40 years ago, we could set our watch by the single thunderstorm that came between 3-3:15 every day. Our weather, like everyone else’s has become a lot more ‘unsettled’. Yes, our weather seems to carry far more extremes all over the workd, but there are many reasons. Long term weather cycles of significant variation have been occurring for billions of years. While we might be responsible for ‘some’ ozone-related factors, I think we are simply in the throes of a major cycle shift. While diehard environmentalists and their scientists adhere to ‘proof’ that humans have caused weather change, any pilot worth his salt will tell you that pilots primarily study solar flares when they fly because that’s what affects weather patterns the most. Our measurable solar flares have been steadily increasing in both frequency and intensity over the last decade. Just this year there have been several bursts that are larger than any on record. I’m not sure why the effect if solar flares is not better communicated and understood, except I suspect the most radical environmentalists don’t want that factored into the discussions. I tend to take a balanced view of any political issue. We were put here on earth for a reason, and utilizing earth’s assets above and below ground are reasonable things to do for our survival and comfort. But they must be done in carefully studied and responsible ways. Also, as population grows exponentially, we are living places that have always had extreme weather events, but they weren’t destructive to human life and dwellings until developments were allowed in typically heavy weather areas. Settlements in many parts of the US should never have been allowed when they are in typical ‘tornado alleys’ and flood zones. Sorry I’m a bit late in replying to this Sammy – I’ve been swamped with book stuff! I’m actually really enjoying the discussion – please stay on your soapbox!! That’s really interesting about the solar flares, I hadn’t heard about them. I totally agree with your point that we are in the middle of a major shift. I’m sure pollution and human influence have an effect as well, but I always think that big natural disasters are a reminder that human influence and power to change things is really minimal, at least compared to what nature can do. I read an article a while ago putting forth the theory that we are coming out of an ice age, so what we are seeing is very much in line with the planetary cycle that has been going on for millions of years. The prediction for example is that Southern Europe and Southern France will soon be too hot and arid to make good wine (in the next 20 years or so) and England will become the next big area for wine in Europe. I don’t think that’s bad or good, it’s just different. Both countries will have to adapt. There are definitely positives to these changes too: massive areas that until now were under ice are slowly becoming accessible (such as in Greenland) and they’re full of resources. It’s maybe simplistic, but I think this is a reminder that we are the ones who need to adapt and change with our environment – we can’t control it. And part of me thinks that with the enormous advances in science of the 20th century, that kind of became the thinking: that humans could control nature (which is obviously not the case). So then when things started obviously changing, it made sense to look at our own behaviour to explain those changes. I think it’s also far easier to say that humans are behind those climactic changes, than to say that we have no control over the changes taking place on our planet….Going back to the solar flares you mention, it’s pretty clear that we have zero influence on the sun while it has a massive influence on Earth. That’s a far scarier thought than to say that aerosols are responsible for the rise in temperature. I can see why environmentalists might not want to advertise the solar flare effect though – the way resources are used and extracted is already so often done in a completely irresponsible way, if people are given a convenient ‘out’ that proves that pollution, waste, extreme consumption etc doesn’t in fact have much of an effect on the environment, it might then become even harder to control that kind of behaviour. That said, I’m starting to see a bit of a shift though generally speaking in the Western world (not to much in Asia) away from big productions, large corporations, and towards smaller, more sustainable companies – and this in all kinds of different industries. Whether it’s buying hand made stuff on etsy, or going to farmer’s markets, or dealing with small, local companies over large multinationals. I think that’s really encouraging, because that change in mentality , and that disinterest in rampant consumerism should over time have a positive impact on our immediate environment. But either way, it’s definitely a time of change which is always a bit scary! You are SO right! We need to adapt to very long term changing conditions; the nature won’t adapt to us. In addition to the solar flares, i think the volcanic activity over the last 20 years has caused far more atmospheric pollution and affected changes more than is acknowledged. Going back to total annihilation of dinosaurs and other soecies over time was certainly not a manmade carastrophe. The earth will survive through anythin but human population might not. The shifts in the teutonic plates have also been occurring far longer than we’ve been. Fracking, mining and utilizing earth’s resources is fine as long as – like you point out – we do it responsibly. I’ve seen plenty of areas here and ither places where mining followed by environmentally responsible reclamation has worked out just fine and rebuilt our land to its original condition. I hope you are right about trends to less consumerism, more natural quality and even growing our own gardens, etc. it us so much more satisfying to live closer to the earth. Although i’m a free-market capitalist and fiscal conservative desiring a MUCH smaller federal gov’t and a return if power to the states, I’m also an earth muffin about wanting to live simply with a small footprint. Unfortunately my Hub and family are not that way, and it’s a constant ‘nit’ for me that I’m giving in to so many practices I don’t agree with. I do what I can while trying to live without conflict but it is definitely more of a capitulation than I would like. Great talking to you. Your thoughts stimulate me to renew my efforts to reduce my waste and give away much I don’t need that gathers dust ehen instead it could be used by someone in need. I love me a good summer cloudscape, especially thunderheads! I can always view your photos properly on my phone, the iPad and the laptop and lovely photos they are too! Great! Thanks for the feedback, Eileen. I hope you have a lovely weekend, and I wonder how all your spring pot plantings are faring! I love the photos and descriptions. For the record, they display nicely on my laptop. I love the description of the fire-fighting plane. I have never seen a plane, but I have seen helicopters and you’re right, gratitude isn’t enough word for that effort. the clouds are beautiful, regardless of what they might be packing. I love the reflections in the pond. I’m a sucker for reflections. Thanks, Dan, for the feedback. I think helicopters (here) carry the massive bucket of water, and the air tankers carry the slurry. They both appear so heavily-laden, I don’t know how they stay aloft. We have a lot of reservoirs in the area, so air traffic can get quite busy with unusual flight patterns. Thankfully not this year, and I hope that good fortune continues through July (which can be a month of fast-moving afternoon storms with hundreds of lightning strikes. I like reflections, too – in my mind and on the water. It would be one reason to devote time to a good camera and acquiring some photography skills beyond point and shoot! I desperately need 27-hour days. I’d happily give you three hours of every Monday, but you have to take the ones between 6:30 am and 3:30 pm. Deal? We live very close the airport. The Air Guard Unit sometimes practices the bucket pickups and drops. It’s fascinating to watch. I hope you have a greener summer. Hey, I almost forgot – grab a copy of today’s Wall Street Journal. There’s a great column at the bottom of page A11 about Rod Serling who died 40 years ago today. I tried to access it at the Journal’s online site but I don’t have an online subscription, so only the first paragraph is available. We were driving back from Buena Vista just the other day and had the pleasure of seeing some towering thunderheads building as we made our way north on I-25. Nearly drove off the pavement several times as I was doing more cloud-watching than road-watching. Oh man, that drive to/from Buena Vista and the scenes in that area are some of the best views in the state. 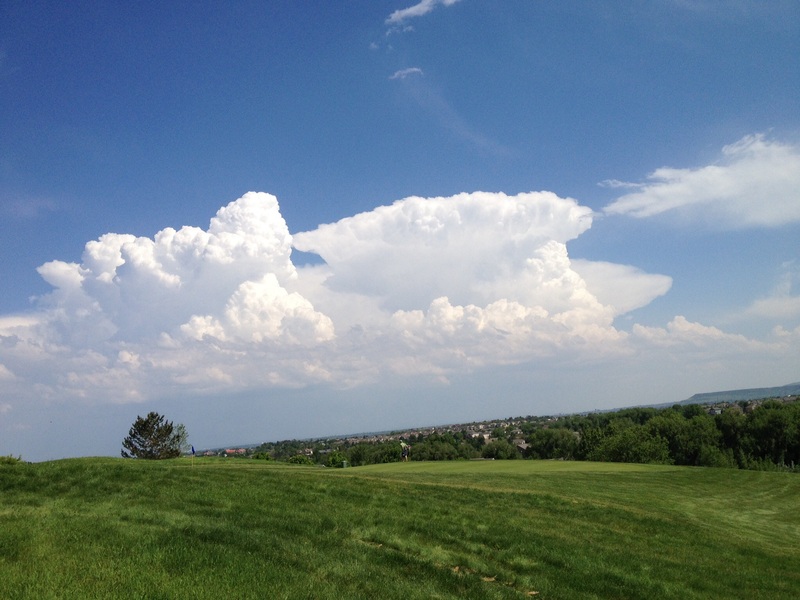 Glad you were able to (safely) enjoy one of Colorado’s best features – our thunderheads! What about when they start getting those tinges of pink or yellow? So much fun to watch Mother Nature’s show! Lovely pics, and narrative. We have Indian paint brushes (maybe a different flower, but when I was growing up that’s what they were called) at my family’s summer cabin in upstate NY (Adirondacks, where those escaped convicts are holed up!) I love them so much that I wanted them in my wedding bouquet, but when I asked, the florist had no idea what I was talking about. I love those and the weed version of bachelor buttons, which grow along roadsides here. On a garden tour last weekend, I saw that someone had transplanted this weed into their formal English garden, and I laughed, and heartily agreed with their choice. 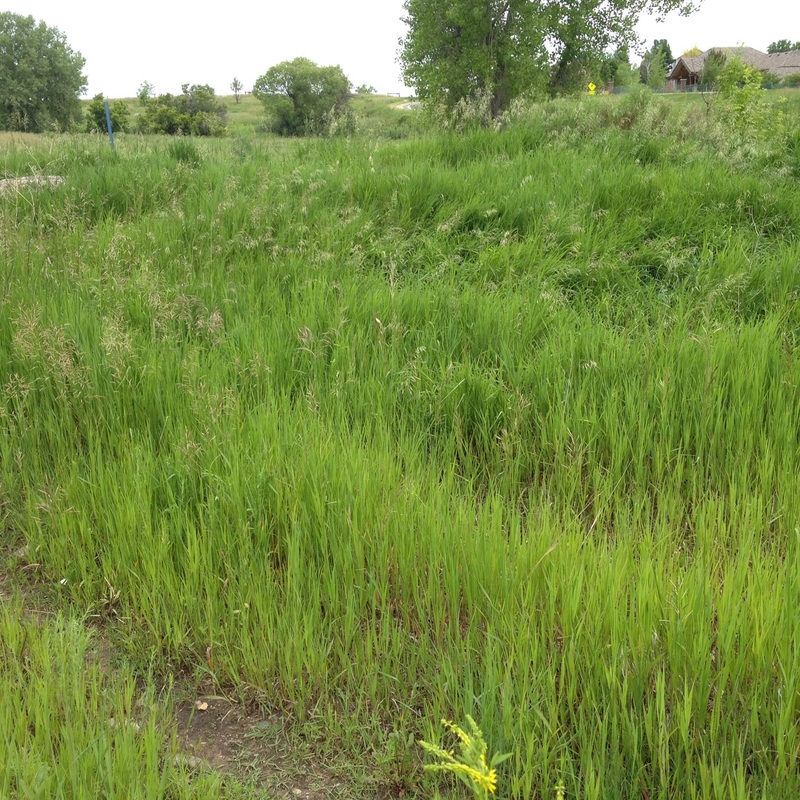 Sometimes weeds are as pretty and deserving of display as more cultivated varieties…kind of like people! They are, Elizabeth! We have a blue flower that grows wild and I haven’t been able to identify it. I often wonder what makes some beauties weeds. Just like the clover, I wish there could be a smidge of dandelions that didn’t get sprayed so we could eat the greens. The Adirondacks would be a truly heavenly place to have a retreat; we visited once when young and I’m determined to get back there (once they catch those bad boys)!! 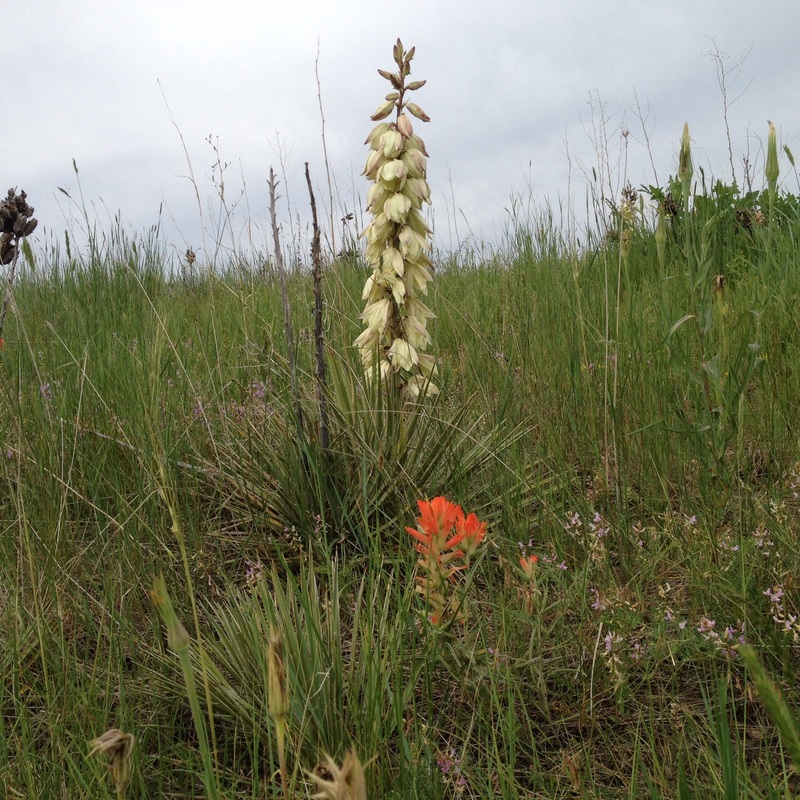 I doubt Indian paintbrush grows east of Wyoming and Colorado, but now you’ve piqued my curiosity!! Whatta lovely post! Look at all those beautiful skies! Wow! Thanks for sharing the spoils of your summers — looks fantastic! No way!! I’m checking out that society ; I’ll be hooked 😀. Thank you. I know what you mean about not being sure of what your readers are actually seeing. Be assured that your photos look great! I remember driving east towards Denver on our recent road trip and being amazed at all the snow. It was beautiful, but this SoCal gal wasn’t all that comfortable driving in it at rapid highway speeds. That was late April. Now, in late June it looks so different! You live in a beautiful part of the country! I just love the cloud formations. Thanks, Janis, for letting me know the photos come thru ok. I’m not a skilled photographer (! ), but at least I know you can see them 😀 Our mountain peaks are stilled covered with snow because May was so cool that snowmelt was delayed – a good thing since our heavy rains have over-filled reservoirs and streams. (Flood or Fire or Drought seem to be the main seasons in CA & CO!!). I don’t like driving in snow either – too many roadies without winter driving skills or decent tires!! Do you ever find that you only see what you want to see, Sammy? 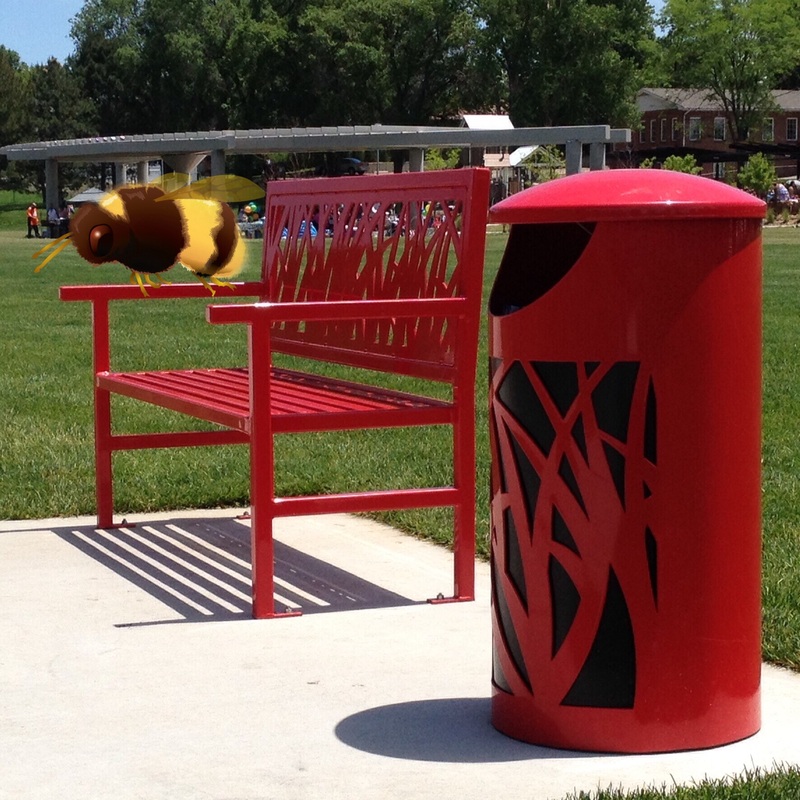 I missed that bee completely when I applauded your red bench the first time. 🙂 I loved the clouds but am sorry for the consequences. LOL Good thing you didn’t sit down next to that little honey-maker, Jo 😀. Thanks for visiting. I take photos of clouds almost every other day. They fascinate me, the “blue” lately has been extraordinary, Sammy. Ih, and your greens are gorgeous. 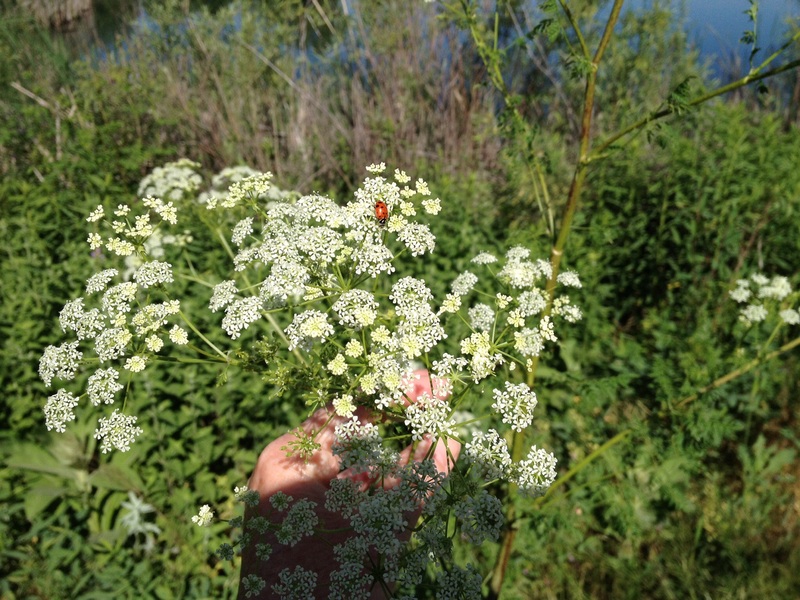 the Queen Anne’s Lace with tiny, bright red lady bug was my favorite. I used to carry those around like they were a scepter to knight someone with. I like drawing children’s names, with their room colors and details fascinate me. “Ih” means “oh.” I wrote a post once about the man who was a creative genius who made up quirky details in “Twilight Zone.” (The alien on the plane’s wing.) I also wrote about an advertising photographer who created a martini glass photo which meant taking the photo shoot into the Sahara desert. (It may have been a famous label’s “dry” gin.) It was really cool. Once I read about someone I want to investigate more. Thank you so much for stopping by and enjoying ‘my’ clouds. I am eagerly anticipating the fun we will all have during the upcoming Cherished Blogfest. Great photos and thanks for the reminder that all that rain makes nature bloom in full glory. I needed that reminder as we continue to suffer through a month of seemingly endless rain. Oh that’s cute! I loved munching clover as a kid. I don’t mind the rain as I try to embrace a ‘diverse’ spring/summer rather than grumble. But I do fear my depression when cold days of autumn are upon us without enough summer heat. My muscles crave summer. I think you’ve hit the problem on the head. Our winters are so long and cold, when we have a poor summer, the winter afterwards feels so much worse. I didn’t realize you are a golfer. I’m a duffer and am happy to remain so; just love being on the beautiful courses. My problem is that I have no one to play with. 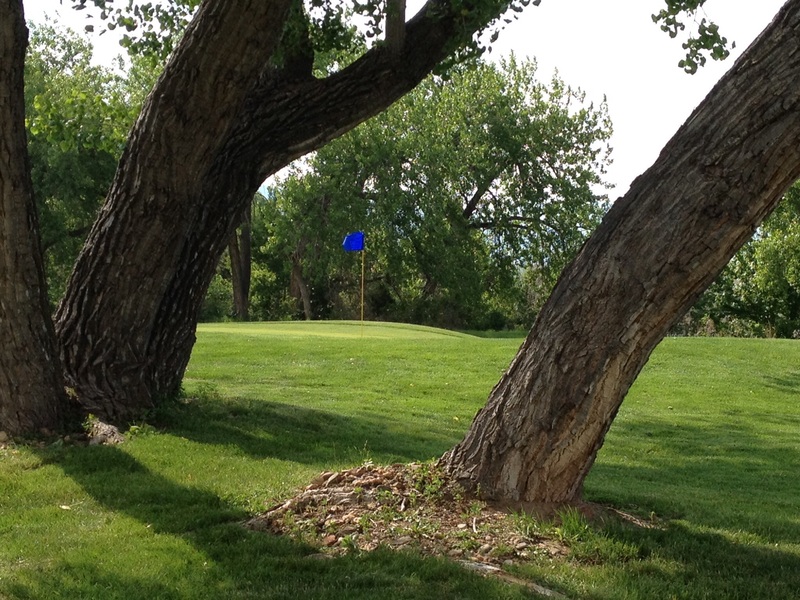 I’ve tried joining a couple of women’s leagues and playing with strangers, but some people really resent playing in a 4-some with someone who plays badly … even if you pick up your ball and maintain the pace of the game. You are so lucky 🙂 … and yes, you are right. My experiences with Ladies’ Leagues is not a good one. I don’t understand why it should matter to anyone if you aren’t delaying the game. Oh well. Clouds are awesome. I live in Santa Fe, NM, and clouds steal the show everyday. They make great ‘copy’ for my Facebook posts! Thanks for sharing, Bemuzin’. Thanks, Mike! I’ve always said New Mexico has The Very Best clouds!! They are somewhat like our thunderheads, but have more distinct borders. One of my favorite artists specialized in southwest clouds – his name us Doug West. Yes, Doug West is talked about here a lot! I have several pieces of his art, but haven’t checked on his whereabouts or artistic ventures in awhile. I will have to Google him! You are fortunate to be able to live in such a beautiful place. The southwest ROCKS! Lovely photos, Sammy! I’ve always been fascinated by clouds and the interesting shapes they take. Thunderclouds are beautiful before they turn black and destructive. It’s kind of strange about those herons. I see them quite a bit around the lake near my house, but they are always solitary. I never see two herons in the same spot. I’ve always wondered why and if they’re lonely. Thank you so much forbeing here. I truly appreciate hearing from you, Lori. You’re welcome, Sammy, and thank you too for being such a good friend. I’m a solitary person, too. It’s hard to explain, but I just enjoy being by myself and doing things by myself. I know that’s probably weird to a lot of people, but I can’t help it. I read that the white ones are young ones. I’ve seen them from time to time in the lake here. I like to watch the birds and wildlife around the lake.